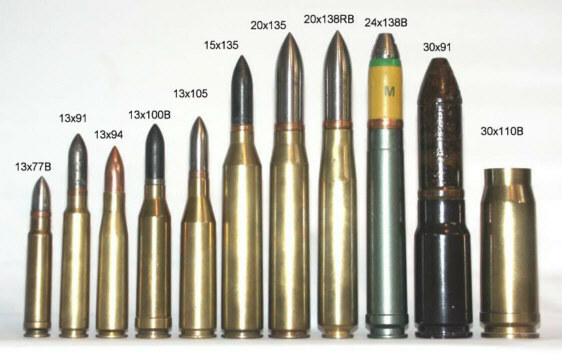 From left to right: 57x307R 6 pr 8 cwt naval, 6 pr 6 cwt WW1 tank, 57x464R 6 pr 10 cwt "Twin Six" WW2 coast defence and naval gun, 57x441R 6 pr 7 cwt AP (WW2 tank/anti-tank and Molins naval and aircraft guns), 57x441R 6 pr 7 cwt APCBC, 57x441R 6 pr 7 cwt APDS (repP), 57x441R 6 pr 7 cwt HE (postwar pattern), 57x515R 6 pr 6 cwt expl WW2/postwar automatic AA gun. 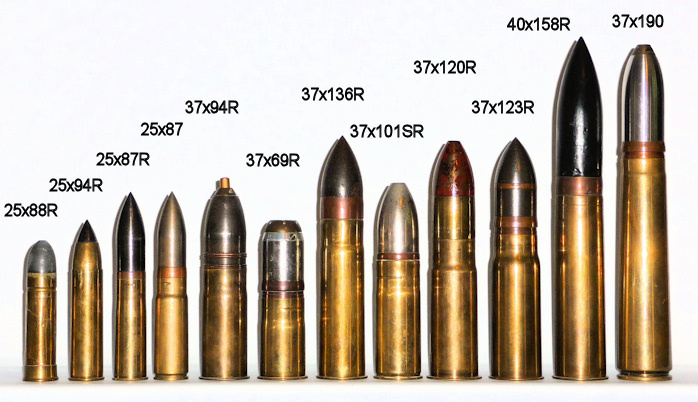 13x77B, 13x91 (Breda), 13x94 (PzB; interim between 13x92SR and 7.92x94 PzB), 13x100B, 13x105, 15x135 (20/15mm Polte), 20x135 (Polte), 20x138RB, 24x138B (the 20x138B necked out), 30x91 (MK 212: Mauser's rival to the MK 108), 30x110B. 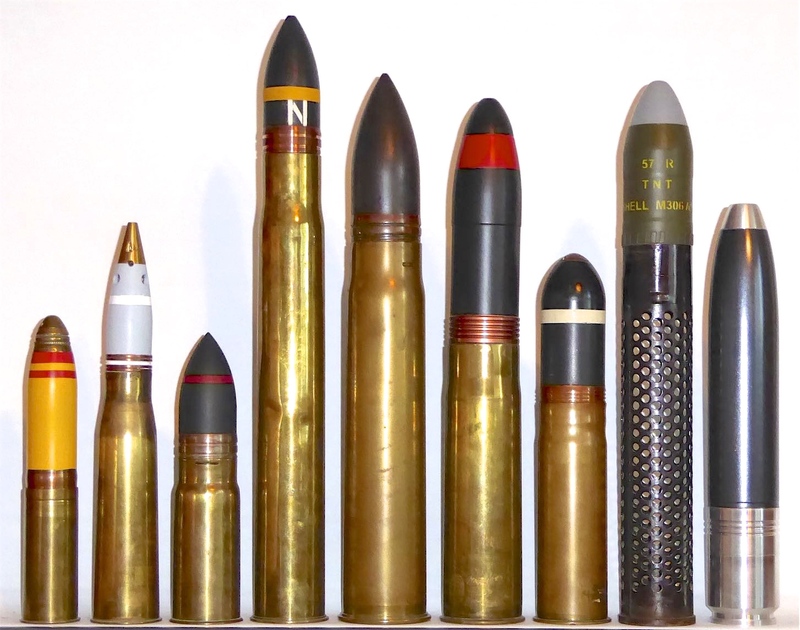 These are all WW2 experimental cartridges (nearly all German) which have been reconstructed from factory drawings (although the projectiles are genuine). 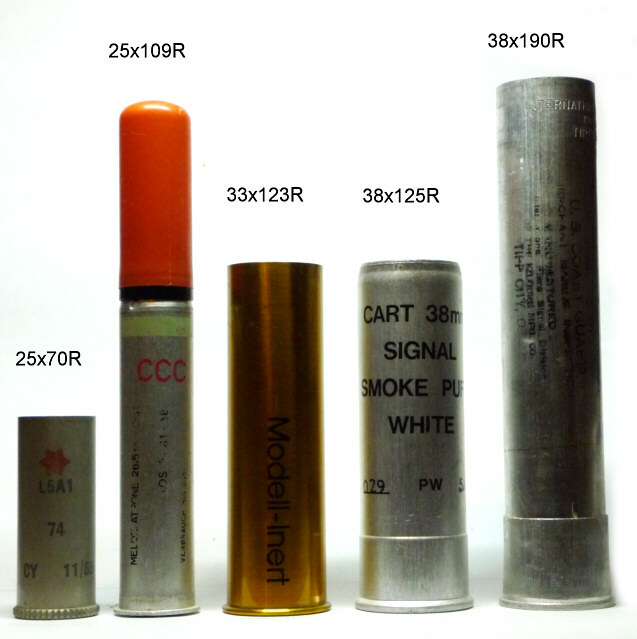 Any more detailed information about these rounds would be welcomed. 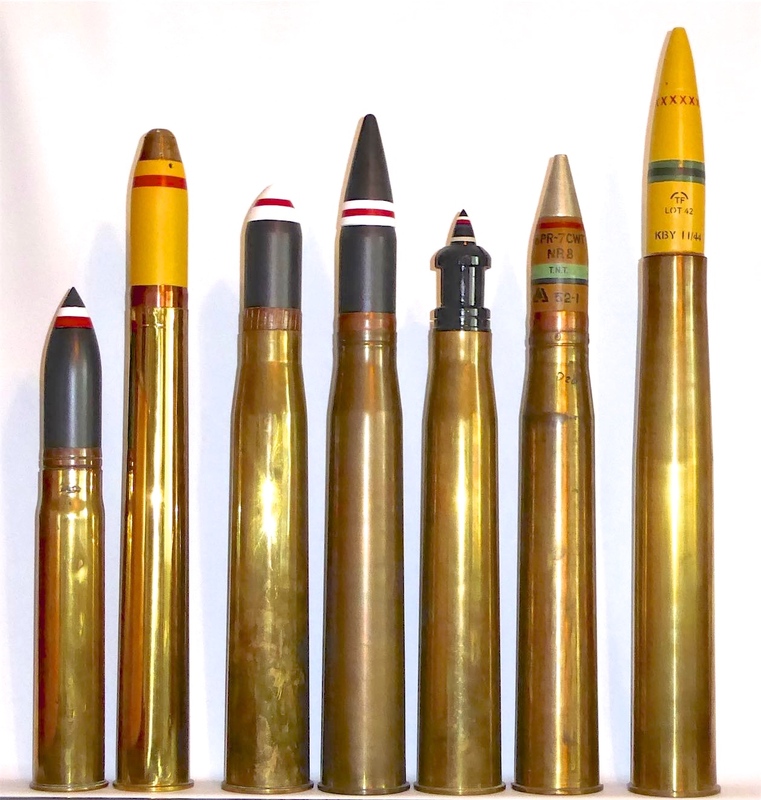 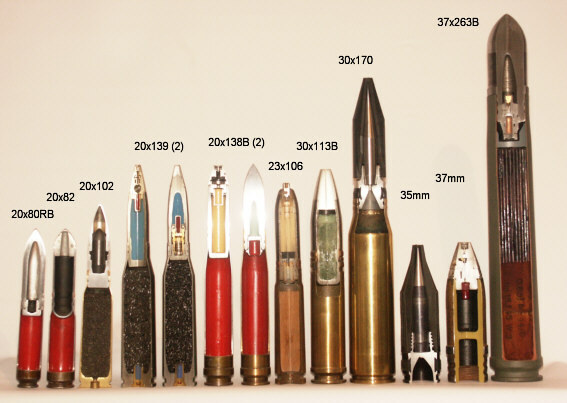 Cartridges developed to match the trajectories of large-calibre weapons, for sub-calibre training and/or for sighting purposes. 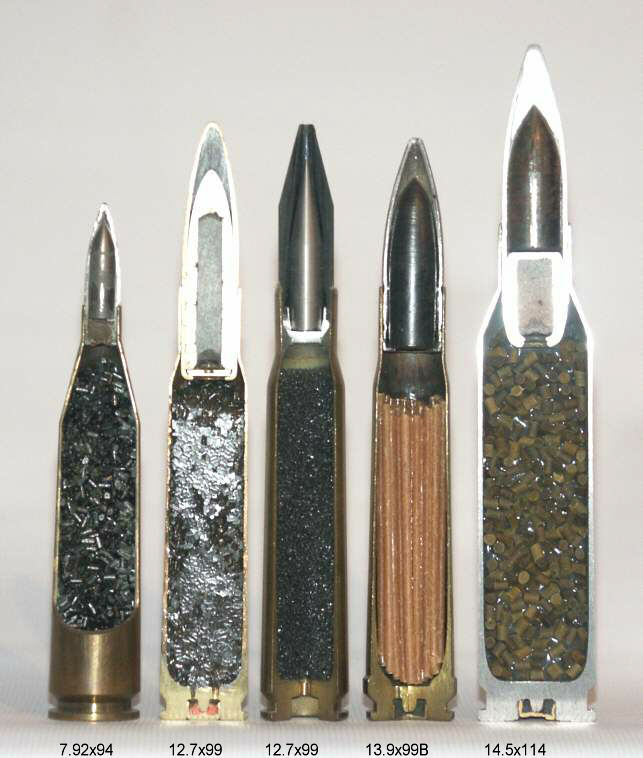 Most of the bullets had tracers and/or were designed to flash on impact.